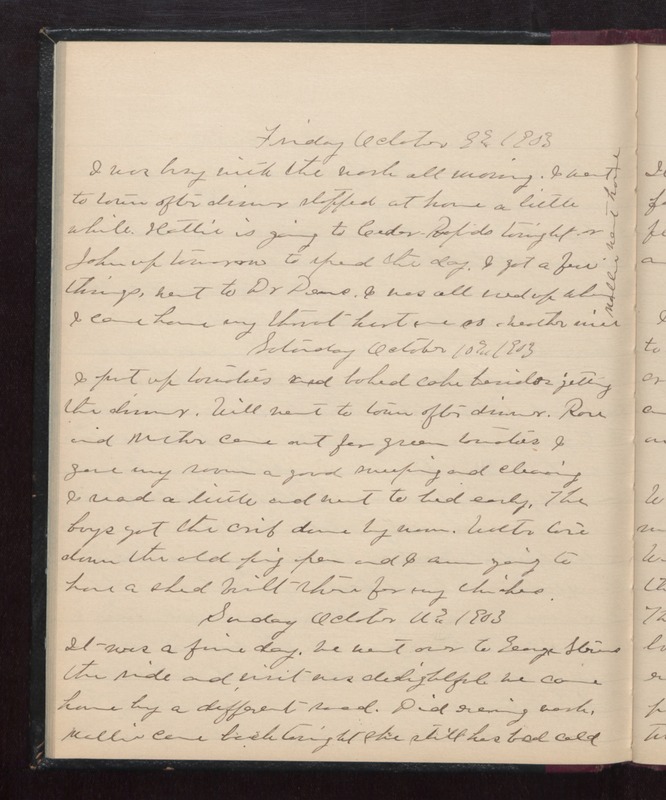 Friday October 9th 1903 I was busy with the work all morning. I went to town after dinner stopped at home a little while. Hattie is going to Cedar Rapids tonight & John up tomorrow to spend the day. I got a few things, went to Dr Deans. I was all used up when I came home. my throat hurt me so. weather nice. Mollie went home. Saturday October 10th 1903 I put up tomatoes and baked cake besides getting the dinner. Will went to town after dinner. Rose and Mother came out for green tomatoes. I gave my room a good sweeping and cleaning. I read a little and went to bed early. The boys got the crib done by noon. Walter tore down the old pig pen and I am going to have a shed built there for my chickens. Sunday October 11th 1903 It was a fine day. We went over to George Stevens the ride and visit was delightful. We came home bu a different road. Did evening work. Mollie came back tonight. she still has bad cold.